Who’s to Say About the Mosquito? Remember this guy? No matter how many times he tried to catch the roadrunner with his technologies and ‘wit’ the roadrunner prevailed and poor Wiley E. Coyote went home hurt. 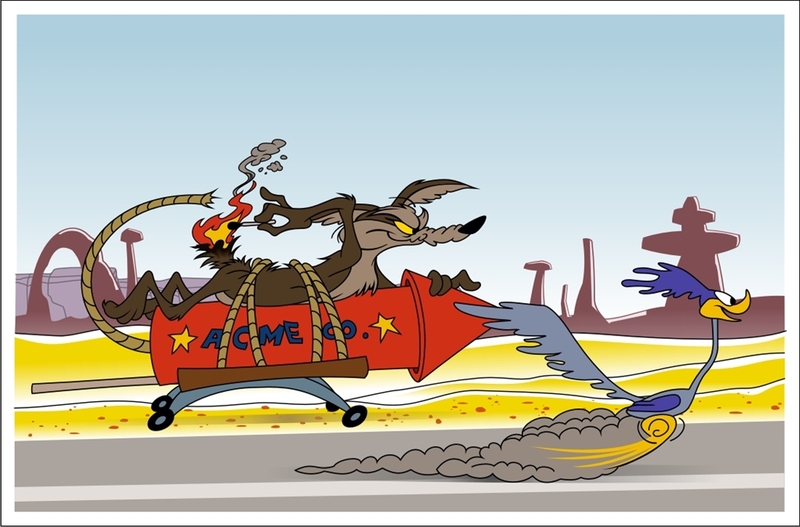 I don’t remember the roadrunner ever committing an act of violence against the Coyote but the Coyote certainly did a number to himself. Humans do this same thing with nature. For instance, our fight against the mosquito has led putting DEET, N -Diethyl-meta-tuluamide, a common active ingredient in insect repellent on our skin and clothes. DEET was originally used by the United States military in jungle warfare. DEET was later found to be a cause of seizures as it could possibly inhibit central nervous system enzyme activity. Thankfully some people have returned to using old holistic methods to prevent mosquito and other insect bites. In general, I hope we slow down before we hurt ourselves. It is true mosquitoes cause harm to human beings. Mosquitoes are known to be the most dangerous animal in the world for its ability to spread viral and parasitic disease. 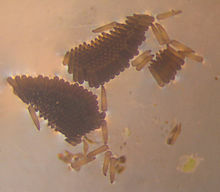 As highlighted in several research studies the mosquito is one of the reasons early colonization of the Americas was not possible. Several populations of would be colonizers in the thousands stepped off boats from Europe but only small numbers in the tens survived because the would be colonizers came in contact with mosquitoes carrying diseases they were new to such as malaria. Sadly for this same reason, slavery became a major institution as Africans were not new to malaria and could survive in areas where malaria spreading mosquitoes existed. Day after day many of the 3500 species under the name mosquito meet in the same place to perform mating rituals. The males live for a week while the female’s life span is one to two weeks in the wild or several months dependent on ambient temperatures, predators, and habitat controls. In extremely cold climates, mosquitoes spend part of the year in diapause. This means until thawed their life is in suspension. Out of the 3500 known species, only a couple hundred are known to spread harmful diseases or even digest blood. There is a scientific and societal debate as to whether the mosquito is a necessary species. Many are confused as to their purpose. Will the fly family clan be missed if no longer living? As of recent years, mosquitoes have been genetically modified to stop their spread of malaria and dengue fever and in some countries, genetic modification has inhibited their ability to reproduce. I wonder if anyone asks if we are overstepping our importance by taking a creature we consider a nuisance and trying to wipe them out. A few more facts about mosquitoes is that their larva is aquatic and standing water is a breeding ground beside fresh and salt water bodies. Due to increased rainfall brought about by climate change, there could be an increase in populations. Mosquitoes are attracted in some cases primarily to the following people; heavy breathers, those who produce a lot of body heat, the pregnant, and especially those of the O blood type. 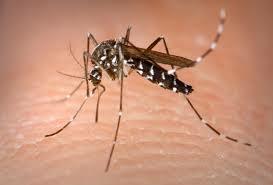 It’s argued the spread of mosquitoes is caused by the destruction of their habitat due to deforestation. Studies suggest the cause of large dengue fever outbreaks is recent deforestation. Most of the land near what was considered colonies of the new world was swamplands and forests. What do you think of the survival of the mosquito? Author Sakari SunPosted on February 6, 2017 Categories UncategorizedLeave a comment on Who’s to Say About the Mosquito? 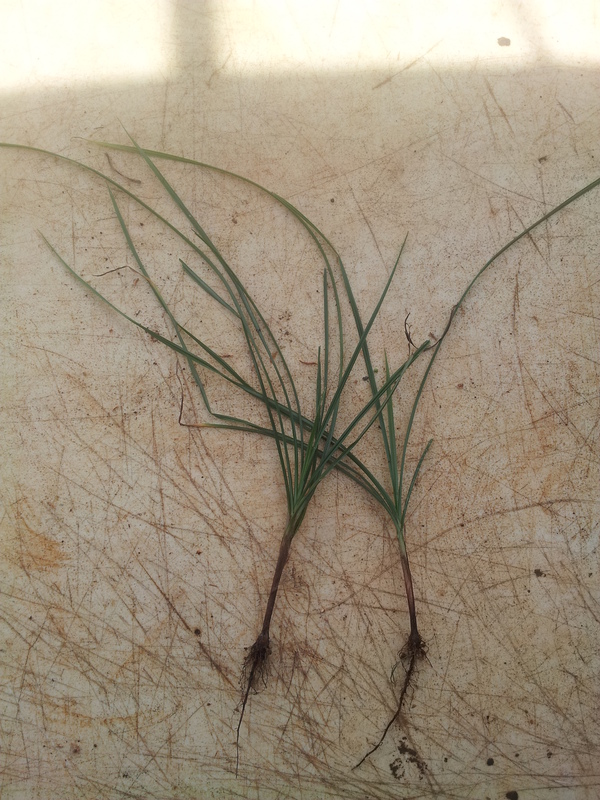 In ancient Sedan streptococcus mutans (tooth decay) may have existed only minimally due to a diet of Cyperus rotundus. Used to regulate chi in ancient China, treat digestive system disorders in ancient India, and dress wounds in the Levant, Cyperus Rotundus, a widespread plant species of Cyperaceae is today considered a nuisance weed. The plant’s tubers provide nutritional benefits to migrating birds. On the island of Kauai, nut weed, as it is known here, is also known to treat the feminine reproductive system. It is resilient. Spraying it with most herbicides only kill it’s leaves.Hoeing it only aid it’s quick regrowth, like Hydra, if you cut it without taking it’s tubers it will spring forth and spread. Most weeds, or shall I say 70 to 90% of the weeds of Earth are edible. Many farmers and gardeners try to either pull the weeds out or spray them, sometimes with chemicals which cause a trickle down effect of hazard to not only the land but the water supply and it’s creatures. Such sprays could be detrimental for humans and land for years, decades, and generations. The lone spotted mother flew drunk and heavy several meters to lay her babies down. Burdens who could eventually be called her children in only a few days time. She found a home for them in the mouth of a fanged pitcher plant known not to exhibit carnivorous longings and staunch acidic fluids. Away she flew to her remaining moments, her flight pattern bouncy as the other critters only lit by certain twilight and phases of the rising moon. Maybe she thought her little ones would act as parasitic creatures, awakening to feed on the visitors of their host. Maybe she thought them to have as much time as she did to meet a swarm and find a place to lay their progeny. But they never did. On one monitoring occasion, he, an ant, noticed them bobbing in the mouth of the flower. Gradually skidding across the waters he grabbed the larvae with his legs. He swam backward pulling them with him and out of the plant where they died. The ant colonizers fed like this daily. 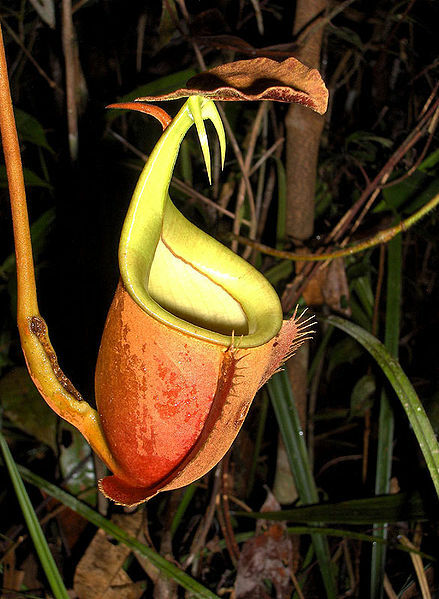 In return for their certain meals with drinks of nectar, the ants gave their dead, feces, and urine to sustain she who is Nepenthes Bicalcarata. She will never need to become carnivorous, she will never need to lose energy becoming elastic like, and she will never need to produce acidic fluids for her meals will be like the meals of the ants who mutually support her; certain, timely, and appreciated. Ants have proven themselves to maintain mutual relationships with various trees and plant species. 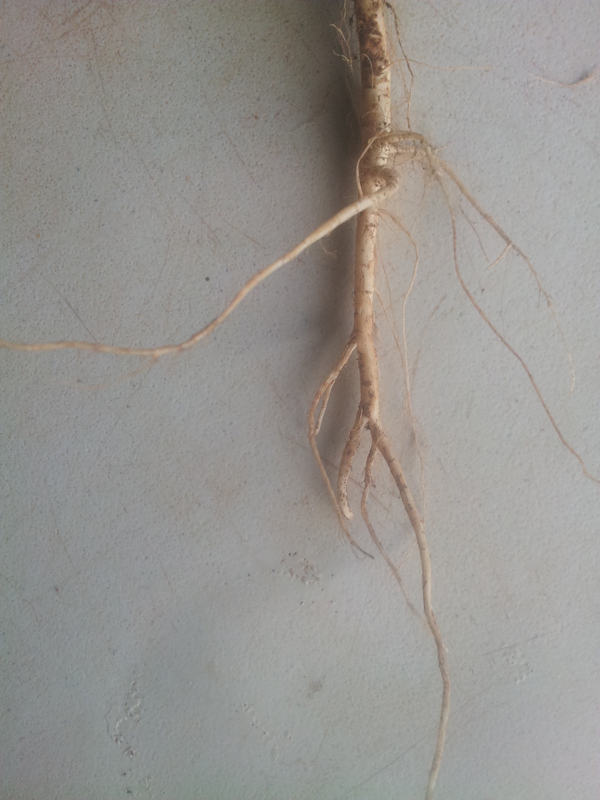 Where ever I sit at the root of a tree here in Sabah plenty come to my feet and march up and down the trunk of the tree. It’s not necessarily a sweet ending when you find that this action from the ants only allow insects to easily slip into the mouth of its host pitcher plant, but the ants wipe the mouth of their host and spring to action hunting any that would harm her by a takeover. The fishermen put flammable ingredients into a bottle and chucked them into the water. When it exploded the stunned fish’s swim bladders ruptured, the loss of buoyancy caused a small number of fish to float to the surface while a good deal sank to the sea floor. The fish targeted were not the only ones who suffered. Other marine life nearby, the waters, and coral reefs were affected by what is known as blast fishing. South East Asia, home of the Coral Triangle A.K.A the Amazon of the Seas, is the number one region depending on Coral Reefs as a means for food supply. Blast fishing has caused a lot of the beautiful habitats, which 25% of marine life depend on, to become either fragmented or outright damaged. 25% percent of known marine life depends on Coral Reefs, which make up 1% of the Earths surface. I want to bring attention to two solutionary programs helping to recreate a healthy Coral Environment for the fish and Marine life of this great region of beautiful biodiversity. First an interview with Scott Maybach, a local marine biologist planting seeded Coral. Next, highlighting a passive acoustic technology (PAM) coupled with an app that alerts Marine Park Rangers of fish bombing activities and pinpoints the exact location of the activity to immediately respond and address perpetrations. Coral Reef seeding or Reef Planting reintroduces live coral to fragmented or damaged coral sights. FWS: To give us an overview of who you are and what you do, I ask what is your background? What brought you to the works you do today? Scott: I am a marine biologist working for an island resort. Basically helping to protect and monitor the reefs as well as foster sustainable use of the reefs for tourism. I founded a marine and turtle rescue center funded by ytlhotels. 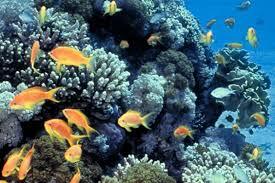 FWS: Large percentages of fish and other marine life depend on coral reefs and live near coastal regions. Can you expound to drive it home for us why these places are of utmost importance to the food web and it’s supporting environment? Scott: About 25 percent of all fish depend on reefs for food and shelter at some stage in their life cycle. Its importance lies in that the majority if people in these regions depend on reefs as their primary food source. FWS: What is the number one cause of coral reef destruction? Can this be remediated? Scott: Habitat degradation, due to coastal development through water pollution and sedimentation, can lead to dead zones. FWS: What is Coral seeding? Can Coral Seeding have long-term benefits for marine life and can these benefits persist despite climate change? Scott: Coral planting is reintroducing live corals to a dead or damaged reef that can have long-term benefits; re climate change is yet to be seen. FWS: How does climate change affect coral reefs? I’ve learned some coral reefs have it in their DNA to protect themselves against rising and high temperatures like 97°, is there a notice in the science communities of coral reef bodies shifting with weather patterns and uncertainties? Scott: Increase temp can lead to coral bleaching and death. If climate change is gradual they can shift but also yet to be seen. FWS: Do coral reefs differ based on regions and the animals that depend on them? A. There are fringing reefs, which are near land and follow the shoreline. B. Barrier reefs, that is offshore usually near big drop offs. C. and Atolls, which are isolated islands built entirely of coral of thousands of years with a lagoon in the center. Coral types will vary by biotope, with light, current, and water quality defining what corals become dominant. FWS: What can we do as a people to protect coral reefs and acknowledge their importance? Scott: Try and avoid buying reef fish for food, and home aquariums. FWS: Can artificial reefs assist in stabilizing marine life populations that depend on coral reefs in the long term? Scott: Yes by providing a habitat for fish and corals. FWS: With artificial reefs are there artificial caves since natural reefs and caves support marine life and each other? Scott: Depending on the artificial reef type, they will have caves of various sizes the largest of which are shipwrecks. For well over 50 years the Tun Sakaran Marine Park in Sabah, Malaysia has experienced fish bombing. A devastating practice which could not only harm the fishermen’s physical health and other fishermen’s economic well being but damage coral reefs and affect the lives of many marine animals in the process. Recently, using a passive acoustic monitoring (PAM) device fish bombing in the area can be detected in real time and immediately brought to the attention of park rangers using their mobile phones. The technology system will act as a tracking measure. The hope of the program is to eliminate the practice of fish bombing in the Marine Park and stop perpetrators in their tracks. This project is managed by the Marine Conservation Society and is funded by the Save Our Seas Foundation. Thanks to Scott Maybach and Elizabeth Wood, Program Lead for the Eliminating Fish Bombing project for information in support of this post. FWS: They Call Me a Bat. Only one at a time. She had me first. In the beginning, there was only mothers milk until I heard something innate and primal awakening me to my relationship with trees. I could hear their call from a deep place called instinct. Like a man eating something holy to him without his molars, I take their fruits to my nest and eat only what fills me. Spit, seeds, and pulp falls to the ground and becomes a new tree. It’s mutual they feed me I feed her. Being fruitful, literally, helping them to multiply. There is a multitude at my disposal when twilight comes. Suddenly, napping and grooming turns to hunting and stalking prey. I catch the tail end of the sunset the birds go in we go out. What will end up in my claws could it be moths you can’t get rid of, mosquitoes you clamor to run from, could it be fruits whose seeds want out? It all depends on whom you’re watching. I’ve known cousins who feed on blood, small mammals, and fish from lakes, rivers, and streams. Biting as they do large palm leaves creating tents with their teeth. My specialty is not my sight it’s in my hearing, it’s in my olfactory senses. I send a sound so profound it bounces off the belly of my prey so I come grabbing them in mid-air wrapping them in a pocket of my wing taking them back to my place. Glad to be here. My mother waited for the appropriate time. When the insects would be plentiful when the rain would not be a hindrance to my search for food. Legend tells my father implanted her long before she decided to give birth to me. Gave me time to know how to harvest what comes after the winter and rainy seasons so that I may relax in hibernation and remember what to look for when spring comes a calling. Did you know Lion is my distant cousin? Some of us if you stand close enough look like miniature foxes wrapped in sheaths of wings. Now threats such as wind turbines disturb our kind on distant lands. Millions have died already from white fungus a disease that disturbs hibernating bats and makes them exhausted to death in America. You need us! Plants need us! Sure enough, we are the second largest group of mammals on the planet. But we earn our keep. We do our best. 70% of our food is insects you call pests. You can’t imagine the world that exists without us. 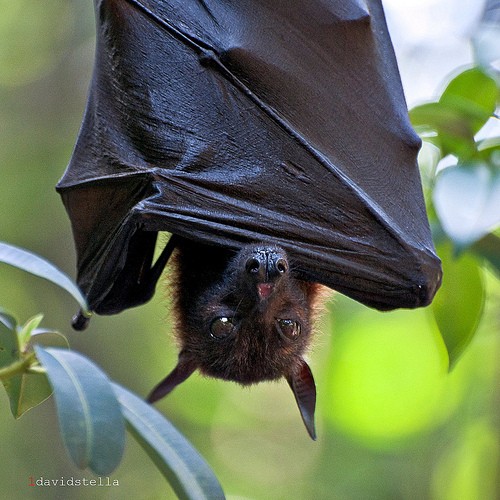 They call me a bat. 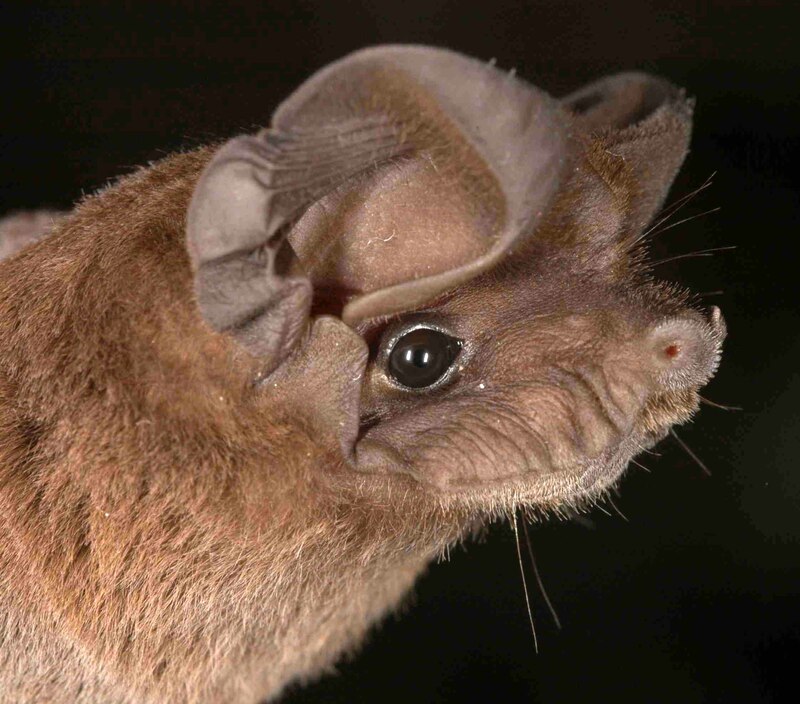 Author Sakari SunPosted on February 5, 2017 Categories UncategorizedLeave a comment on FWS: They Call Me a Bat.